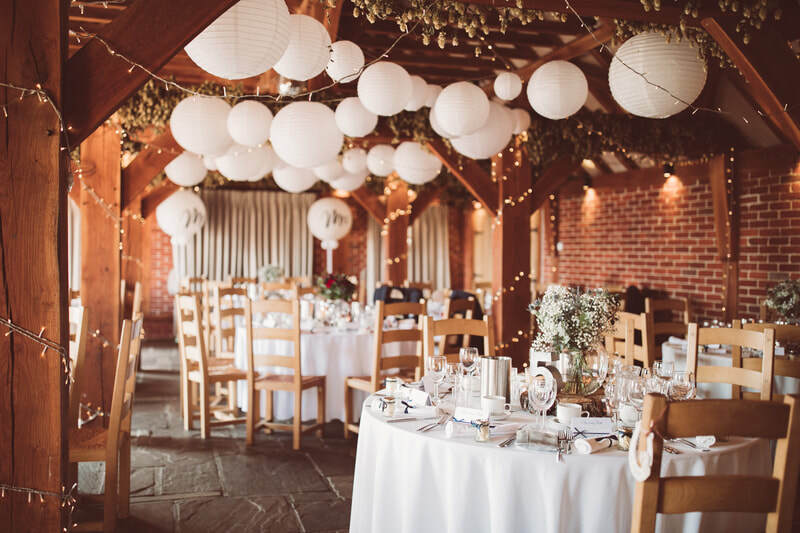 How to decorate your wedding can be a a labour of love, or a real headache - depending on your inclination and how you feel about the more creative elements to the planning process. ​The wedding decor that looks best is that which embraces the style of the venue. ​Big round balloons look lovely - party balloons or balloon arches do not suit the venue ambience. 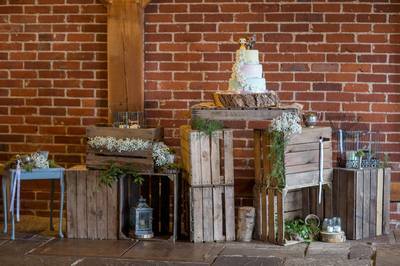 Jam jars, anything wooden, bunting etc works great in the barn. 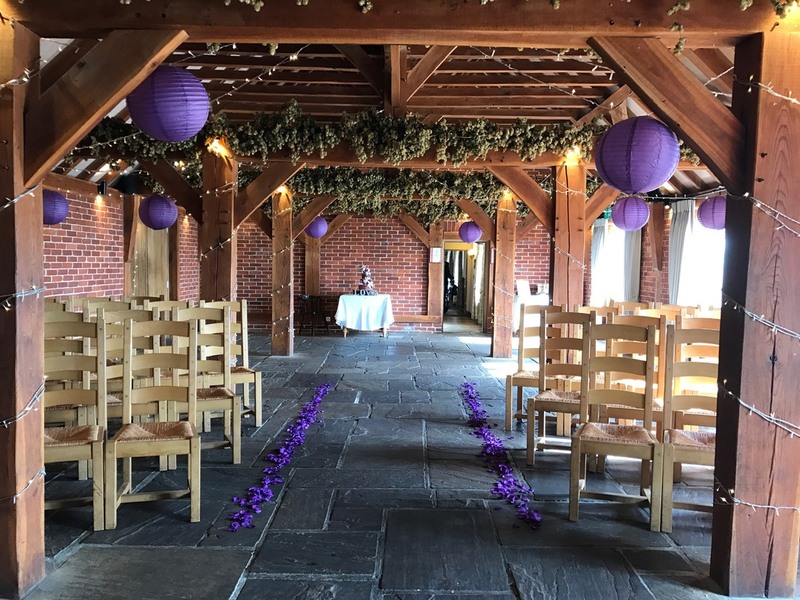 Planning your decor ...if the thought fills you with dread, just book a stylist, seriously it will make such a difference to not only how things look but how you feel about the look of the wedding too - you will feel happy when you see it (probably relieved too!) and having someone else do the hard work will pay off. It would be a shame to not have the photos etc looking pretty and the last thing you want to do is be stressed in the run up, or worse, disappointed on the day that you didn't 'do more'. You are more likely also then to 'get it right first time' rather than buying the odd thing here and there that then you need to sell or don't use as they don't work how you imagined. 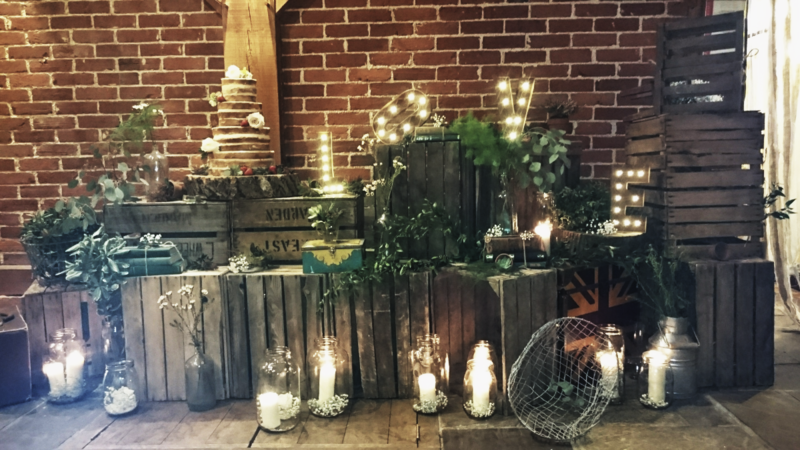 Simple decor can and does work well (more so in the barn than marquee) - but if you want to go all out don't be afraid to. In the marquee think bold / big rather than dainty / small. You want a wow factor in what is quite a large space. You can achieve this with either : Volume of items (so if doing pom poms hanging do 30 not 3 for example), Size of items and Height can help. 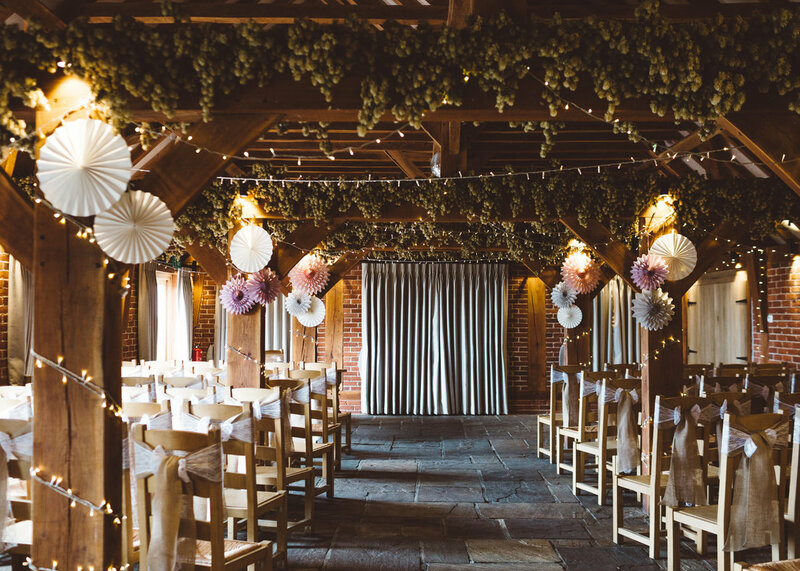 We recommend either tall centrepieces and/or something from the ceiling. This makes a really big different to the wow factor when you enter the room and the overall 'look' will be amazing. Brighter colours carry better than pastels in the marquee. Picking Decor Related Suppliers... when thinking about suppliers, one thing that can make a surprising difference is your suppliers relationship with each other, ones who have worked together before produce better results generally - for example Idyllic Days & The Flower Company work together on the day to ensure styling elements are combined with the floristry, they then may assist with decorating the cake table to tie this in to the theme of the decor - this is a really underestimated element but it makes a big difference in the overall picture of the wedding, so is something worth thinking about. As a venue we can really tell when the decorator and florist won't work together, it ends up in a disjointed final picture. Imagination ... imagining your decor can be really hard, please book to visit if you want to have a walk around to envisage your plan, an appointment if you want to talk it over, and you can also practice table layouts if you wish too. Candles, we premit max 3 tea lights allowed per wedding breakfast table, cake table and guest book table unless LED. No naked flames permitted so all candles must in jam jars where the flame is housed. No real candles are permitted anywhere else at the venue, i.e. aisle, ladder display etc. 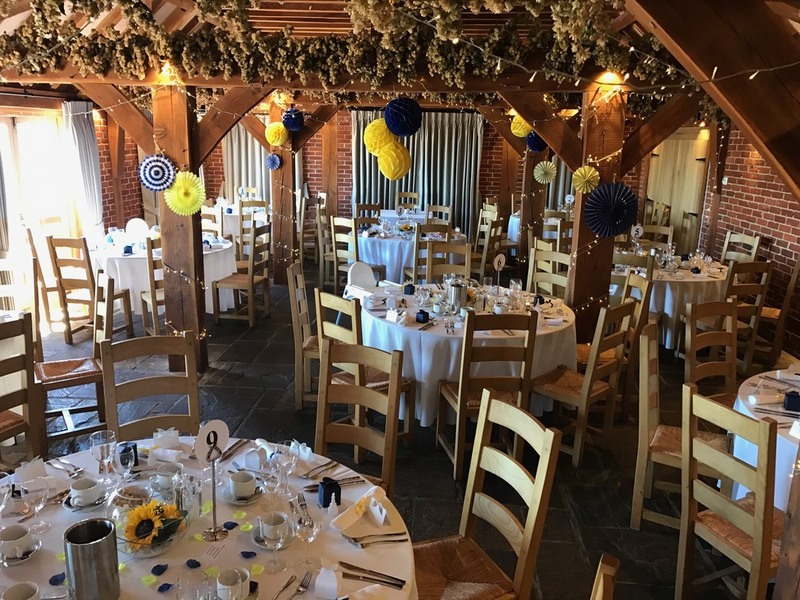 Our table decoration service includes putting out everything you need on the tables, plus putting up signs inside/outside on the patio, bunting outside if you provide, hanging items in the gazebo, or putting any beam decor on as shown in above photos. Pom Poms/lanterns or any hanging items - we can hang pom poms as shown above in the barn. Bunting we can put up your bunting along the beams, maximum 3 seats plus any to go behind top/cake/guest tables. For the marquee standard Health and Safety rules stipulate a safety license is required to use the ladder heights involved - this needs to be an approved supplier (Balloonatic and Idyllic Days from our supplier list are approved). If the bunting or pom poms etc is DIY provided, then we can hire in approved safety staff to do this for you at the following rates. Please note we need notifying in advance as these staff need to be contracted to be on site at the correct date and time. Maximum 3 centre hangings (pom pom etc), items provided strung ready to hang - free of charge. Poms poms/lanterns throughout 30 = £75, 30+ ask for quote (note we do not recommend less than 30 as they get 'lost' in such a large space and the affect can be disappointing. 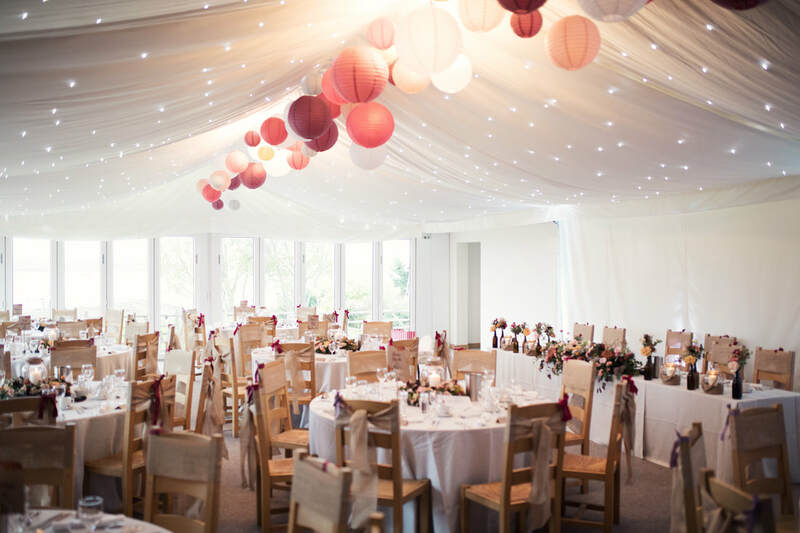 Although popular we also advise not choosing colours that are ivory, white, or too light for ceiling decor in the marquee as they can get a little lost against the ivory ceiling). Hoops - £25 Per Hoop, these create a 'wow' factor as you walk in and are big in trend this year. 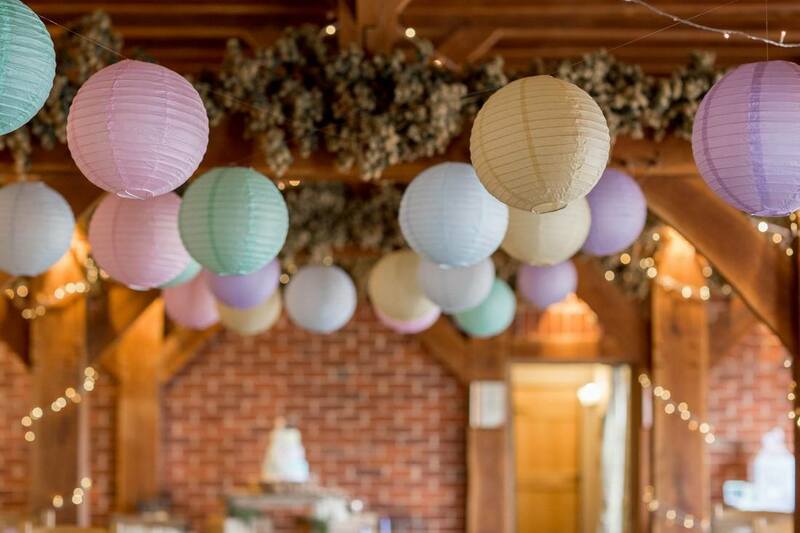 - Paper pom-poms/lanterns etc– we are happy to hang them up for you, but they must arrive ‘inflated’ and ready to go and that sufficient string/wire is provided to do so. Please see below advice on where we can / cannot hang these. - Sweet tables - If you have decided to supply a sweet table that has not been provided by us or another supplier, all sweets must come in the jars (or other) ready to be laid out, i.e. not in separate packets for us to arrange, and no millions or rainbow drops are allowed. - Balloons and all other inflatables must come ready to go and inflated, if you wish to inflate on site you must remove all gas canisters from site as we cannot dispose of them. 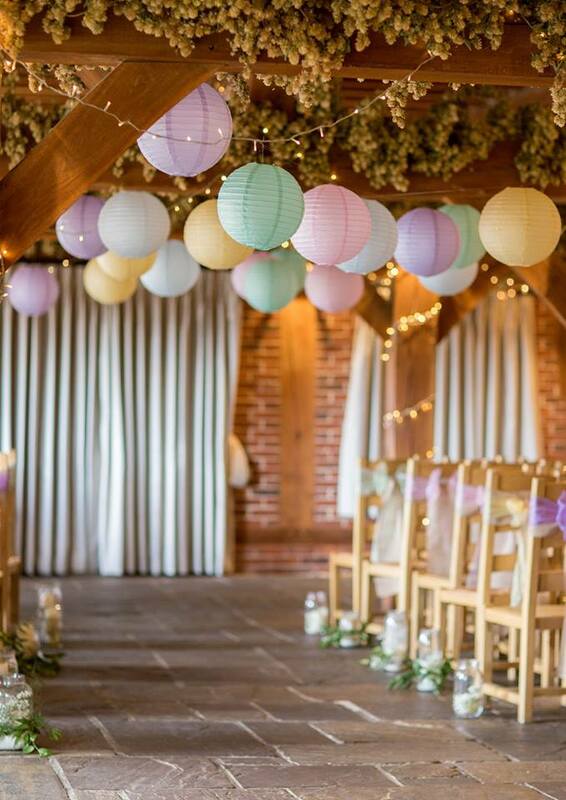 Round balloons work well with the venue's style - please avoid party balloons as these do not. - Signs - if you wish to put signs up along the road you may do so, but we insist these are taken down before 10.30am the following day - please take someone in your bridal party who will not forget to do this. As there is also a church on the same road, we advise you use more specific signage than "Wedding" as this can be confusing for guests. As we discuss your décor plans in your itinerary and final meeting we can always offer advice on specific items that are applicable to your wedding. If in doubt, you can always email before your drop off to double check. 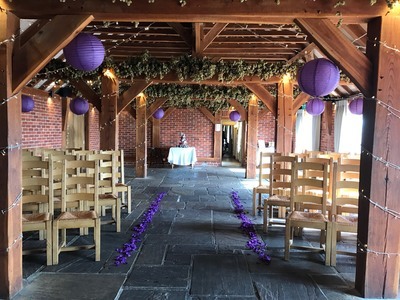 Many brides opt for 'diy' decor to save on costs, understandably, however please understand that as the venue we are not stylists and apart from the setting the tables (including card table/cake table) we do not have the expertise or time to carry out tasks you would usually hire a styling company to do. If you need 'extra' decor put up for you, like crate displays assembled, or lanterns put up, chair bows etc, then feel free to contact us for a price and we can hire in separate staff in to do this for you. We strongly advise you not to send family or friends to do this for you as what is envisaged as being 'idyllic and fun' is usually actually a fraught and stressful time for them, as it always takes a lot longer than people imagine, and with also the need for them to get ready in the morning it is generally not a fun or relaxing atmosphere, but actually quite the opposite start to what is an important day for them too. The following photos are to demonstrate the difference in capabilities between decor companies and what we can do for you. ​We are more than happy to put up your decorations but we like the expectations of what we can deliver to be clear for all.